Jimmy Eat World is an American rock band from Mesa, Arizona, that formed in 1993. The band is composed of lead vocalist and guitarist Jim Adkins, guitarist and backing vocalist Tom Linton, bassist Rick Burch and drummer Zach Lind. 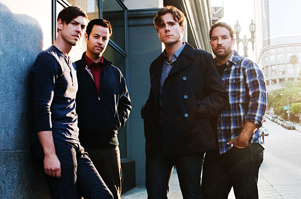 As of June 2013, Jimmy Eat World has released eight studio albums, the last seven featuring the current lineup. The four piece’s commercial breakthrough came with the successful release of several singles from the album Bleed American (2001). Four singles from the album charted within the top twenty positions of the Hot Modern Rock Tracks chart, with “The Middle” reaching the number one position. Jimmy Eat World’s follow-up album Futures (2004) featured another Modern Rock Tracks number one song, “Pain”. The RIAA certified Bleed American platinum and Futures gold, rewarding the two albums for selling over one and a half million records between them. The band’s sixth album Chase This Light (2007) became the band’s highest charting album, peaking at number five on the Billboard 200. © 2019 Copyright Jimmy Eat World Tour Dates.